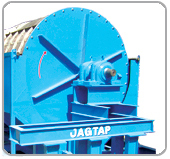 "High Performance way of Removing Suspended Solids from Liquids” this “Jagtap” principle introduces liquid under minimum head loss conditions and rotates the screen in the opposite direction so that maximum shear velocity is achieved. 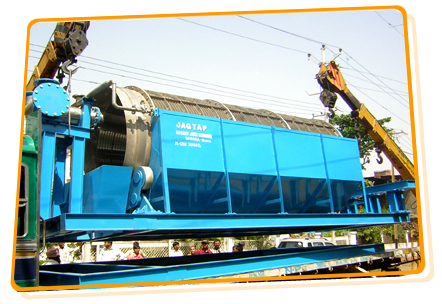 This is used for fast separation of solids from liquid. This principle not only carries the operation at reduced cost, but also increases substantially the quantity of raw juice handled on a specific screen size. Screening efficiency is also improved as, in all cases; the raw juice is introduced tangentially on to the contra-rotating face. Because of the shallow approach, this system also increases the percentage of Bagacillo capture off the screen surface. Drums rotating in same direction as that of the juice flow, causes flooding of the juice adversely affecting screening efficiency. A fine gradient is provided, while mounting the screen, towards discharge end. The gradient is kept to a minimum to allow increased retention period. While higher percentage of juice recovery is assured in this arrangement, it also helps improve drying of Bagacillo to some extent. 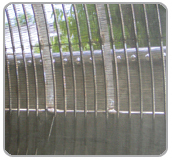 The rotating screen is a unique metal to metal welded wedge bar screen with aperture size ranging from 0.2 to 0.7mm as also as per customer’s demands. Rotary screen sizes range from 1000 mm to 2400 mm ID and from 1000 mm to 5600 mm long. 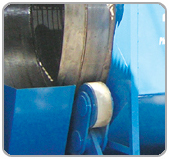 Flow rates are dependent on Rotary Screen’s open area and size.